With one race done, Australia, and 20 to go here are the team standings. I have a particular interest in Fernando Alonso (McLaren) as my son is his performance engineer this year. He did the last 4 races in this position last year. 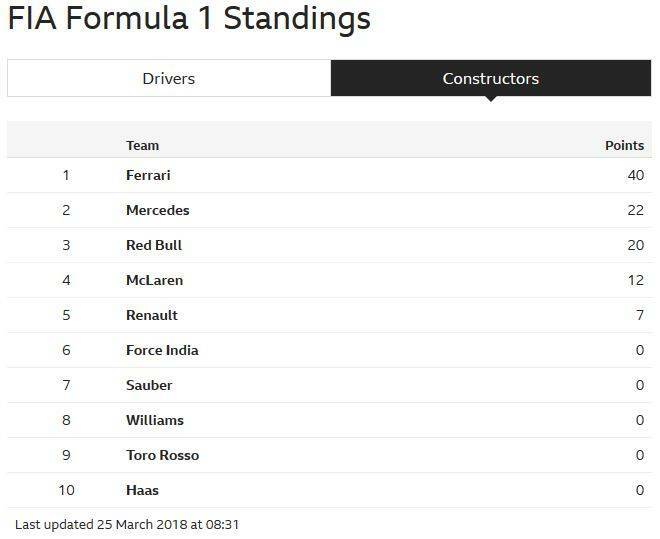 Mclaren should be in 5th as Haas totally fucked their pit stops and dropped both cars out of the points. Haas is effectively Ferrari Lite as it uses last years Ferrari engine and all the components they can from Ferrari. This is an interesting situation as last year the teams had 5 engines per driver, this year it's 3 so they are running on engines that will be well worn out. They can rebuild to a certain extent but only some elements. If they replace some elements they have to take grid place penalties. What teams do is they do all the work before a race they don't think they will have done well in anyway. 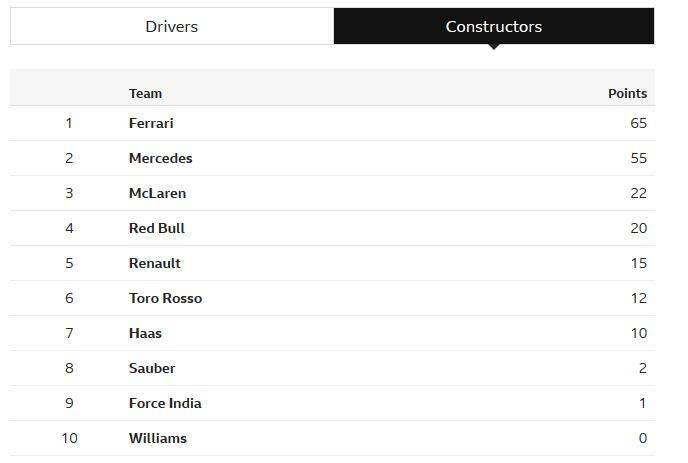 This means they take 20, 30 or even 50 place penalties in one race so whatever they do they will start from the back of the grid. They just run the cars very softly in the 1st qualifying session and finish last and still start last. Somewhat pathetic system in my view. 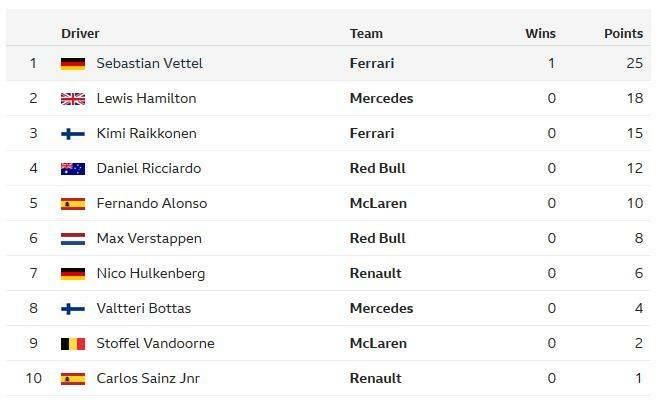 As a point of interest Red Bull, Mclaren and Renault all run the same engines so relative performance between these 3 teams is down to the engineers, designers and drivers. This weeks race is in Bahrain it's generally one of the better races for action and overtaking. It's very tight on fuel which is my son's responsibility. They cars can start with a maximum of 100Kg of fuel but they never do, they start with as little as they dare. The target is to come across the finishing line with 100g of fuel in the tank. If the car runs out of fuel the team takes a penalty because after the race the fuel is sampled and tested to check for cheating so no fuel no check. If the car runs out of fuel the team takes a penalty because after the race the fuel is sampled and tested to check for cheating so no fuel no check. Precision, precision...I wonder just how precise calculations can be to make sure there is enough fuel to sample after the race. I'm a big fan of Max Verstappen. 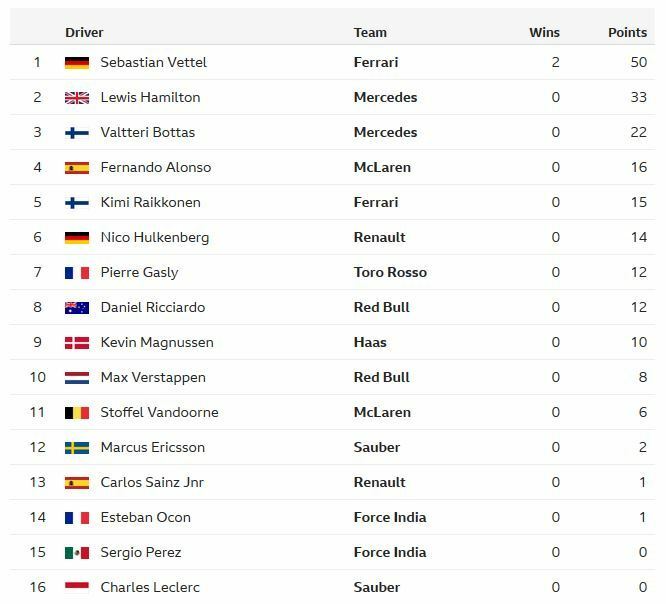 Positions after 2 races, 19 to go.